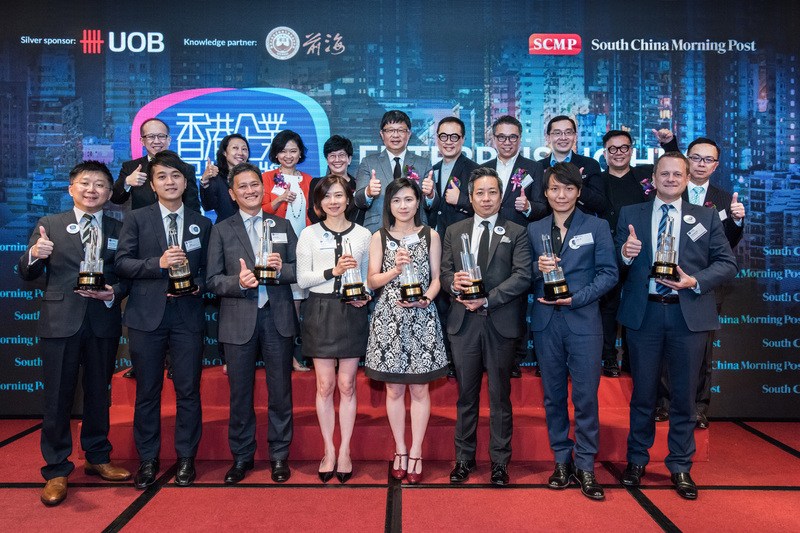 Hong Kong, 12 July, 2016 – Enterprising Hong Kong Brand Awards, organised by South China Morning Post Publishers Limited, has awarded 11 outstanding publicly-listed and privately-held enterprises in recognition of their brand excellence. Established in 2014, the Awards recalibrated its focus this year to celebrate homegrown enterprises which led the market with brilliance in developing and sustaining strong branding. Caption: The Enterprising Hong Kong Brand Awards 2016 winners include (front row, from left) Mr Jacky Kwan, Chairman of Bamboos Professional Nursing Services; Mr Alfred Wong, Area Manager of Tung Fong Hung; Mr Sammy Kam, Technical Director of Octopus Cards Ltd.; Ms Winnie Ho, Head of Branding and Marketing Communications of 3 Hong Kong; Ms Annis Chung, Administrative Officer of 4M; Mr Patrick So, General Manager of Arome Bakery HK Co Ltd.; Mr Leslie Fok, Marketing Director, D2 Place; Mr Christopher Birt, General Manager, Inflight Services of Hong Kong Airlines. The Awards are supported by an esteemed judging panel including (back row, from left) Mr Gordon Lo, Director, Business Management of Hong Kong Productivity Council; Ms Enoch Yiu, Chief Reporter of the South China Morning Post; Mrs Christine Ip, Managing Director and CEO, Greater China of United Overseas Bank Limited; Professor Angelina Yuen, Vice President (Student and Global Affairs) of The Hong Kong Polytechnic University; Mr Robin Hu, Chief Executive Officer, South China Morning Post Publishers; Mr Raymond Ho, Chairman of The Hong Kong Advertisers Association; Mr Eric Yim, Deputy Chairman of the Federation of Hong Kong Industries; Dr Edmund Lee, Executive Director of Hong Kong Design Centre; Mr Spencer Wong, Chairman of The Association of Accredited Advertising Agency of Hong Kong and Mr Stephen Liang, Director of Product Promotion of Hong Kong Trade Development Council. First published in 1903, the newspaper has developed an enviable reputation for authoritative, influential and independent reporting on Hong Kong, China and the rest of Asia. Available in print, mobile, tablets and online through scmp.com and e-reader editions, the South China Morning Post reaches a global audience with daily breaking news, analysis and opinion, multimedia articles and interactive forums. The South China Morning Post received 200 awards in 2015-16 for excellence in editorial, marketing and technical capabilities. Other titles in the company include the Sunday Morning Post, Nanzao.com (南早.com), Nanzaozhinan.com (南早香港指南.com), STYLE, Destination Macau, The PEAK, HK Magazine and The List.